Are the following logical statements all axioms of propositional calculus? I have found conflicting lists of axioms in propositional calculus in Kleene, $2002$, and on Wikipedia. From what I can tell, carefully reasoning through each of the statements reveals that are tautologies, and since the only real understanding I have surroundings logical axioms is that they are tautologies, I can't quite decide which source to trust. 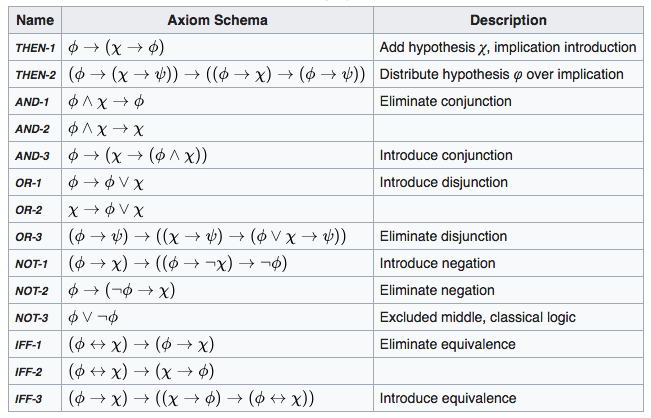 There are many different (but equivalent) axiomatizations of propositional calculus. See e.g. List of Hilbert systems. The fist nine are the same. Kleene's version does not use the $\Leftrightarrow$ connectives; thus, the last three axioms of Wiki's list are not needed in Kleene's version. The only real difference regards the axioms fo $\lnot$. Kleene's axiom 10 is Double Negation elimination : it is equivalent to LEM (axiom not-3). No, what gets listed are not axioms. None of those are well-formed, and thus to call them axioms is not correct. That said, it probably isn't difficult for many who know an appropriate definition of a well-formed formula to write the intended axioms from the symbols given. Not the answer you're looking for? Browse other questions tagged propositional-calculus axioms or ask your own question. What is the “correct” reading of $\bot$? Propositional Calculus, Can someone answer the following?